My network and home automation installation have become essential to life in our home. Without smarthome controller, the automatisms disappear. Without a server, no more mail, music, TV, internet access :-(. A power breakdown is therefore an increasingly feared event, but more than that the deterioration of some device due to power hazardswould be disastrous. After an unexpected shutdown of the server probably due to an overloading on mains, I decided to set up my long autonomy uninterruptible power supply whose elements were waiting patiently. Maximum power sufficient to power eedomus, server and network rack, so around 75 Watts of power. 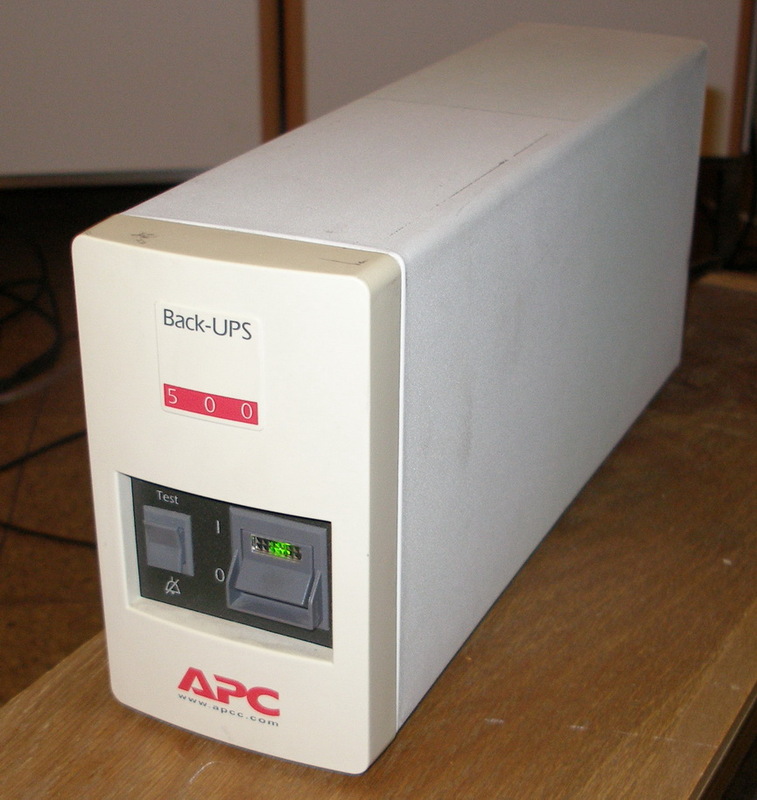 An used APC 500 UPS. We can find some regularly sold when internal battery is dead. I’ve bought personnaly 2 of those for 20€. I’ve selected a 60Ah battery myself. 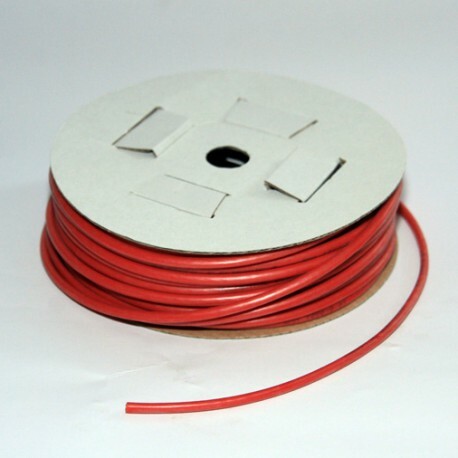 Multi-strand cable 1,5mm2 black and red. Conventional computer UPS use lead-acid batteries. In small models, those are 13.8V batteries, so the same voltage as a car battery. 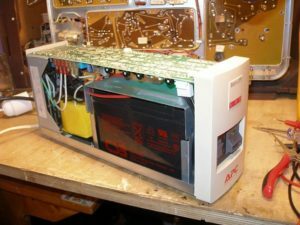 The APC 500 is one of those old models. 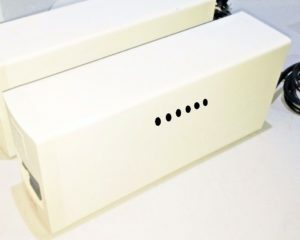 It should also be noted that this is an offline inverter, thus providing an average level of protection: the load is directly connected to the mains in normal conditions, and the power supply is switched to the generator from the battery only in specific case (Power failure, overvoltage). This switching takes a few milliseconds which makes the difference with professional UPS. However, an offline inverter provides a sufficient level of protection for a domestic installation. The inverter is capable of delivering 500W which represents 40 amps on 12V. It is imperative that the cables connecting the UPS to the battery make are at least 6mm2. I put 4 stranded cables of 1,5mm2 in parallel for each poles, ie 4×1,5mm2 = 6mm2. If you have doubts, add cables ! The voltage of a battery is low, but the peak currents that can be supplied are enormous (> 400 amps). 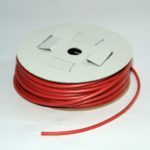 It is imperative to carry out the modifications in complete safety by ensuring at each stage that the insulation between the two poles is good at all points of the system. 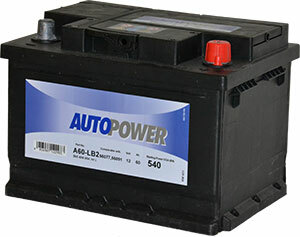 A battery may have a defect in time, such as sinking. The acid can cause a fire. 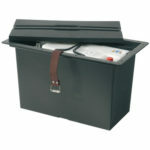 It is necessary to store the battery in a tray designed for this purpose and resistant to acids. The battery charging circuit is not designed for such a battery size. The full charge of the battery therefore takes nearly a week. 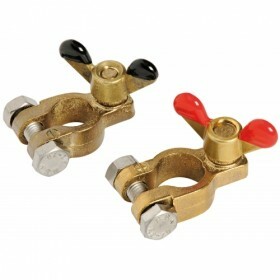 However, it doesn’t create any particular problem in normal use. Remove the old battery from the UPS. Make vents on the sides of the inverter in the metal housing. The UPS is not equipped with a fan because it works normally just during 15 minutes. Secure the terminals on the battery. It is preferable to add a little grease inside the terminals before mounting to ensure a better electrical contact. For a price of about 130 € I now have an UPS allowing me to provide 75 watts during 3 hours, tested and approved. 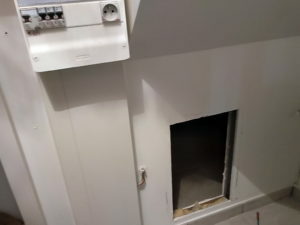 My network and server bay (including server, eedomus home box, ethernet switch, adsl router, wifi access point) and radio alarm clocks in the bedroom are now protected from over-voltage and breakdowns. There remains a problem of location. This set is bulky and heavy (~ 20kg), it must be placed on the ground. 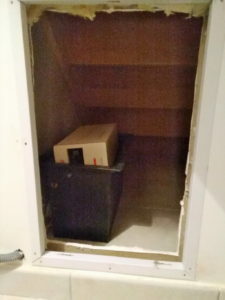 In my case his location was planned in a clearance under the stairs, not far from the electrical panel and the server bay. 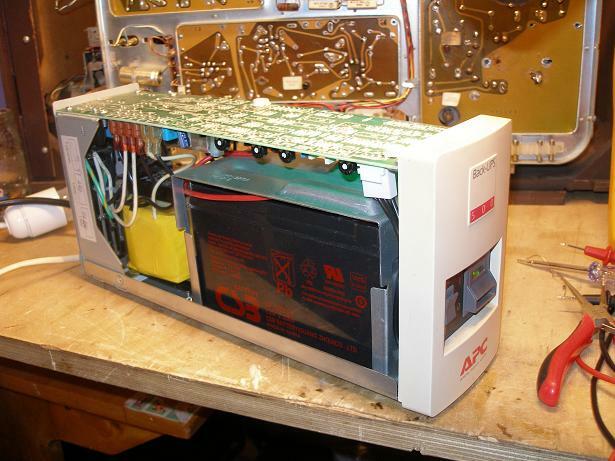 A specific circuit for the clock radio was also reserved. One day of plaster and electricity and the whole installation was functional. Tous les onduleurs “informatiques” ne conviennent pas.